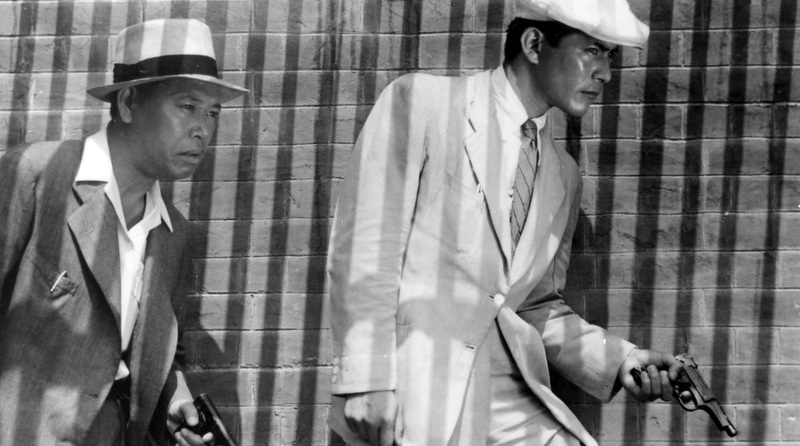 American writer Dashiell Hammett’s novels The Glass Key (1931) and Red Harvest (1929) have often been cited as sources for Kurosawa’s Yojimbo. 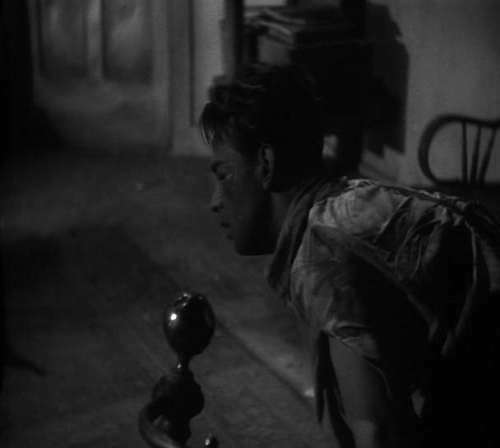 As far as I can know, however, Kurosawa himself rather pointed towards the 1942 film noir adaptation of The Glass Key as the actual source that he used. In any case, considering that it was the month of Yojimbo at our film club and everything, I decided to read the books and watch the film. Sadly, I couldn’t get a hold of the 1935 adaptation of The Glass Key or the 1930 movie Roadhouse Nights, which is a loose adaptation of Red Harvest. Not that those two should actually have anything to do with Yojimbo. But, anyway, here’s what I’ve learnt from what I’ve got. 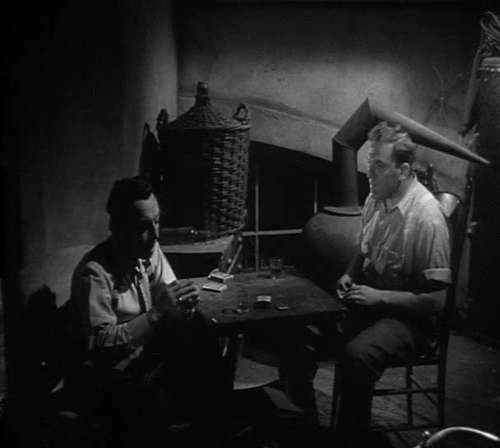 Having been beaten up in the previous scene, we first discover two of the hero’s beaters from the previous scene now playing cards, just like in Yojimbo. 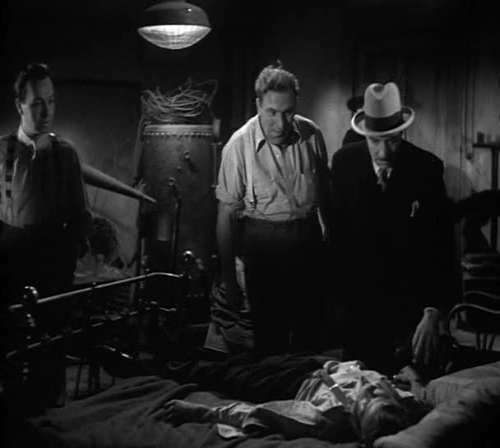 The camera pans out, and we find the hero Ned Beaumont lying on the bed, in visibly poor condition. 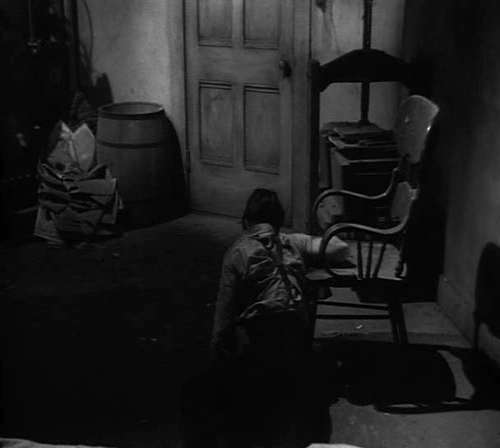 After a moment, Ned gets up and tries his best to make it to the door, very much like Sanjuro does in Yojimbo. 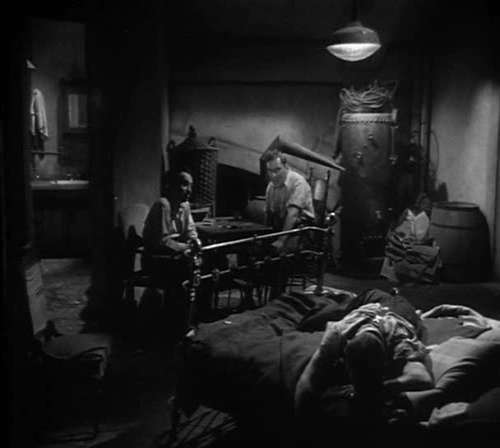 …especially considering the encouragement he gives for Ned to stay in bed, pretty much like does our giant in Yojimbo. Now, the boss arrives and tries to talk to Ned. Unfortunately, he is passed out. Well, there’s nothing like an ice cold bath to sort that out (Ned’s in the bathtub in bottom left in this screenshot). Now he’s awake enough to be talked to. After the boss is finishes with Ned, and has expressed his concern that he should not be beaten up too much, they leave. We cut to the next scene, in which Ned finds himself alone in the room. Again, very much like in Yojimbo. 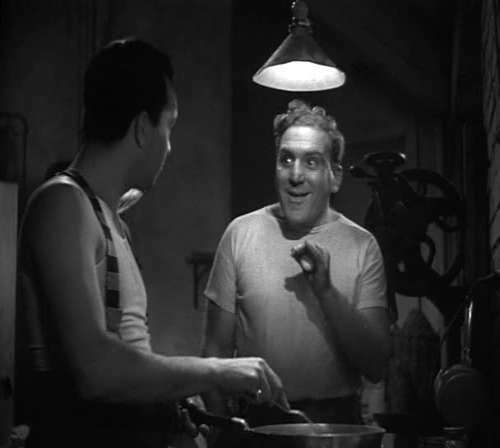 We cut to another room, where the two gangsters are making a steak. 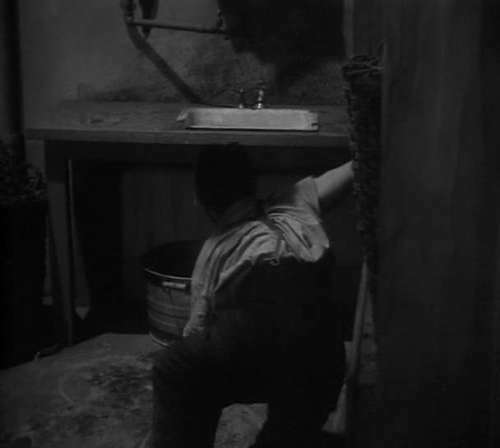 Ned, with movements very familiar to anyone who has seen Yojimbo, drags himself to a sink that he has spotted. After he washes his face, he gives himself a look in the mirror. This shot reminds me of the one of Sanjuro where he is, at the same point in the sequence, lying down and leaning to the wall, just before he notices the box in which he can hide. 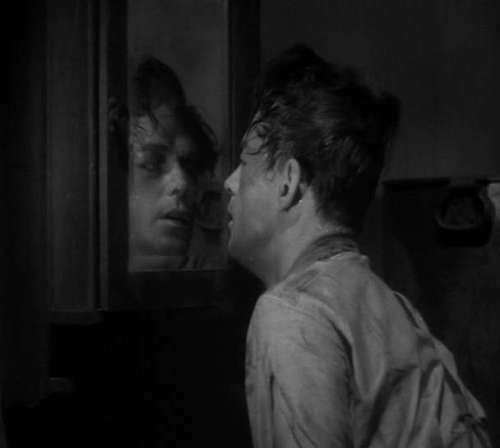 In Yojimbo, it is us who look at Sanjuro’s face, while in The Glass Key Ned looks at himself (and we look at both him and the reflection). From here on, the two films start to differ more. Sanjuro crawls into the large box, while Ned gets himself something to make fire with, and the bed mattress to burn. 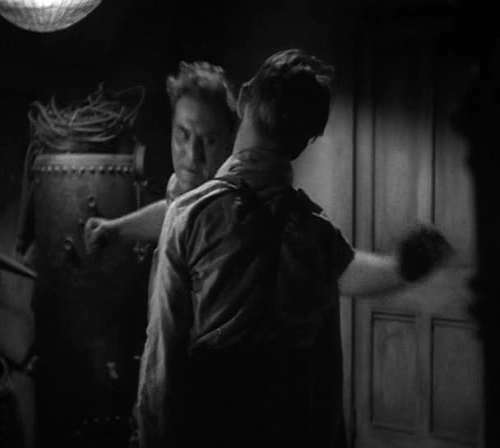 Ned sets fire next to the door, which causes the gangsters to come in, to beat him, and to throw him into the kitchen while they try to put out the fire. What the gangsters have forgotten, however, is that the kitchen has a window, through which Ned then proceeds to escape. There you have it. Too bad that I cannot make screenshots of this scene in Yojimbo for direct comparison. Finally, and again as Prince notes, there is that dog that bites Ned’s hand (this is just before the scene discussed above). Prince’s playful suggestion that it may actually be Ned’s hand that greets Sanjuro at the beginning of Yojimbo is quite a stretch of imagination, but it is an idea that I nevertheless really like. Now, if Kurosawa saw the film adaptation of The Glass Key, and I have no reason to doubt it if he has indeed mentioned it as a source, I don’t really see a particular need for us to assume that he also read the novel. The problem, however, is that I cannot actually find a first-hand source where Kurosawa would mention the film as a source. Yet, I must also say that even if Kurosawa read the novel, he must also have seen the film, so similar is that scene of captivity particularly in terms of its visual presentation. 1) The basic storyline concerns a private investigator who arrives to a mining town only to find that it is thoroughly corrupted by rivals crime gangs. He, together with the town’s police chief (and some other help later on), sets out to destroy the four crime gangs, and they do this by spreading out information and rumours that cause the gangs to fight each other to death. 2) The private investigator has no name, and is only referred to as “the Continental Op”. 3) The villains in the novel are something like caricatures, and the violence is pretty comic at times. While these three points are quite similar to Yojimbo, very little in the rest of the novel seems relevant. The connections could be simply coincidences. 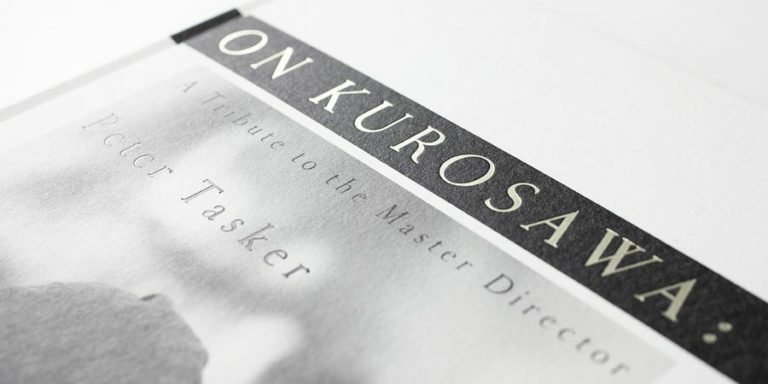 Ultimately, unless someone uncovers a first-hand source showing that Kurosawa either read or didn’t read the novel, I think we will never know. As a closing note, let me say that if you are interested in the three works briefly discussed here, don’t go out of your way in trying to get a hold of them. The Vintage Crime series that has published Hammett’s novels may praise him as not only “a master of the detective novel … but also one hell of a writer” (a quote lifted from The Boston Globe), but at least for someone like me for whom 1930s English language literature rather means Virginia Woolf’s The Waves or the late works of Yeats, Hammett’s writing unfortunately comes across as relatively difficult to follow or to be really interested in. Not that I would like to scare anyone away from these works, but at least you have been warned. Fascinating stuff. I’ve never seen the film adaptation or read the books (the crime genre isn’t really my thing) but it’s probably Red Harvest that I’ve most often heard mentioned as the main source down the years. According to Wikipedia, Richie thinks the similarities with Red Harvest are coincidental, and we have Kurosawa himself on record saying it was The Glass Key. There are apparently several prominent critics who disagree, including David Desser who wrote The Samurai Films of Akira Kurosawa. Salom.com has a rather good article about the Red Harvest legacy, including coverage of our old friends Last Man Standing and A Fistful of Dollars. The problem, however, is that it does not weigh up the evidence for the influence of The Glass Key . The Yojimbo connection kicks off on page 2, by the way. Thanks for the link, Jon! It was a very good article, and almost made me want to read the books again, just to see if I might like them a little bit more on a second go. The Mad Max 3 connection with Yojimbo and Red Harvest was something I didn’t know about. Perhaps I should watch that movie again. Damn, now the Tina Turner song started to play in my head. In any case, considering that Kurosawa must have seen The Glass Key, so clear is Kurosawa’s copying of that one scene, there is a good chance that he might have gone further in his research and read Hammett as well. It just seems impossible to know now. Not sure I would like to revisit Mad Max 3, or anything else with Tina Turner on the soundtrack. 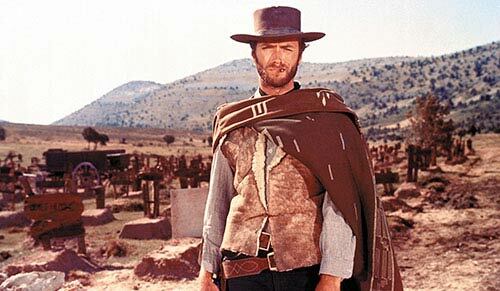 The thing I found funny in the article was the accusations of plagiarism against Last Man Standing – for stealing from A Fistful of Dollars. Maybe it was because they turned the mule into a car? Now that mule was a Leone invention. Yes, I laughed at that as well. Actually, there is much more than simply the car in Last Man Standing that was taken from A Fistful of Dollars rather than Yojimbo. 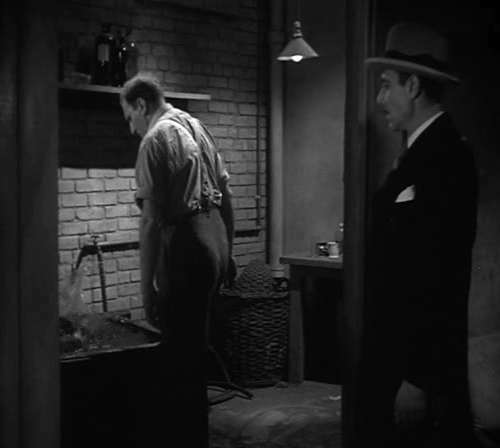 In the end, in terms of its story it really is a remake of both of those films, and with the setting and the film noirish presentation, I think Hammett’s representatives could well have been right in also asking for their fair share of the profits. As I noted earlier, there is an enormous amount of influences flying back and forth between these films (and the other related works), so much so that someone should really sit down and write a book about it. Indeed. A couple of years back, someone (actually I’m pretty sure it was Empire magazine in the UK) made the claim that Red Harvest is the most influential book (or perhaps adapted book) in the history of cinema. Of course, it may not be the only source for some of these films but you get the picture. As far as straightforward adaptations go, I am only aware of one Red Harvest adaptation, which actually is only loosely based on the book. But if you for example consider Yojimbo to have been influenced by the book, and films like Django in turn then influenced by Yojimbo, that connection alone will probably give you a few hundred movies that were indirectly influenced by Red Harvest. Pinning down origins of influences is of course very difficult, as nothing exists in a vacuum. In the case of Red Harvest, for example, there is an element of the western in it. Yet, the article you linked to makes an interesting claim for Hammett actually giving us “the first American antiheroes”. I know very little of American literature apart from the few compulsory courses that I had to sit through at the Uni (American literature somehow never seemed all that interesting to me, apart from the poetry), so I cannot really comment about the validity of this claim. But, whatever the status of Red Harvest, clearly Hammett had an enormous influence on Hollywood. And, it seems, possibly Kurosawa as well. It must have been along the lines of most influential book – obviously they did not mean direct adaptations. But it is amazing to think how many films belong to this family. I’m partial to some American lit myself but I never delved into much crime. Chandler’s very witty, but that’s about it for me. Movies, though, are another matter. 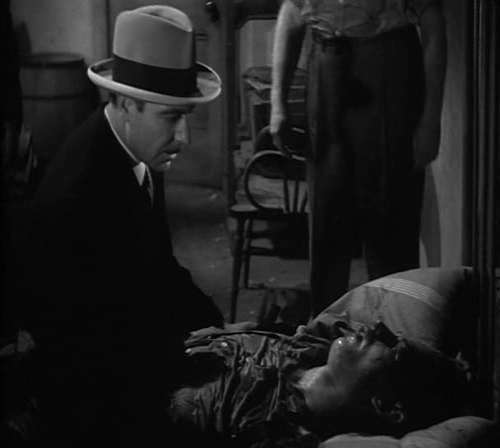 I love those old Humphrey Bogart/Howard Hawks/John Huston movies. 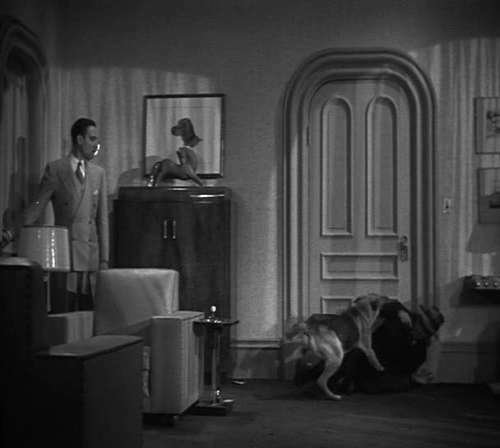 It doesn’t get much better than The Big Sleep. And look at those screenplay credits: William Faulkner! Leigh Brackett (who also co-wrote The Empire Strikes Back and was an acclaimed writer of science fiction). That was a golden age indeed. Jon: I love those old Humphrey Bogart/Howard Hawks/John Huston movies. It doesn’t get much better than The Big Sleep. And look at those screenplay credits: William Faulkner! Leigh Brackett (who also co-wrote The Empire Strikes Back and was an acclaimed writer of science fiction). That was a golden age indeed. There indeed is something very magical about that particular era in Hollywood. For one, they don’t write dialogue like that any more! I just went through RED HARVEST and YOJIMBO back-to-back, and I definitely think the concept is similar enough that inspiration was quite possible, though Kurosawa most certainly did take it off in his own direction, enough so that I wouldn’t call it an adaptation. There was one scene, however, that was strikingly similar between the two. Nearing the end, the hero watches as one gang launches a raid on the other gang’s headquarters, lighting the place on fire. After much chaos, the leader inside shouts that he’s surrendering, that he’s coming out. He emerges from the smoke-filled doorway and the other gang leader shoots him down point-blank. Could you actually give me the chapter and the page number for that scene? I don’t know if we have the same edition, but I’d be really interested in checking that out! We moved away from the front of the house. We waited a moment, and then Pete the Finn appeared in the dynamited doorway, his hands holding the top of his bald head. In the glare from the burning next-door house we could see that his face was cut, his clothes almost all torn off. Stepping over wreckage, the bootlegger came slowly down the steps to the sidewalk. Reno called him a lousy fish-eater and shot him four times in face and body. Pete went down. A man behind me laughed. Thanks for the quote, Noel! Indeed, there is a fairly definite looking connection there. In fact, I think that what you have brought to our attention pretty much suggests that Kurosawa was, indeed, familiar with the novel Red Harvest, as suggested by Desser among others (and refuted by Richie). Perhaps the primary difference between Red Harvest and Yojimbo is that in Yojimbo, the main character is acting on his own initiative, whereas in Red Harvest, the main character and narrator is a private investigator sent to town at the request of Donald Willsson, the publisher of the local newspaper and the son of Elihu Willsson, the man who really runs the town. Donald Willsson is murdered shortly after the nameless main character (usually referred to as the Continental Op, after the name of the agency he works for) arrives, so the father becomes his client. 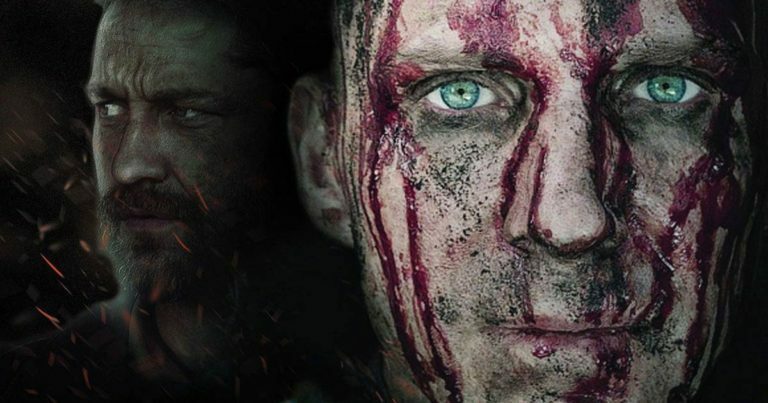 Another difference is that in Red Harvest, Elihu Willsson is the sole force behind local corruption, and only lost control of it after he brought thugs in to break a strike at the mine that is his and the town’s primary business. Afterward, the thugs stay and cause trouble, acting as if control of the town were their reward for success in breaking the strike. The three rival groups of thugs, plus the police, who form a fourth ‘gang’, run the town in relative harmony before the narrator’s arrival. In Yojimbo, the town is divided into two warring camps, including two different mayors, before Sanjuro arrives. The first floor was ankle-deep with booze that was still gurgling from bullet holes in the stacked-up cases and barrels that filled most of the house. 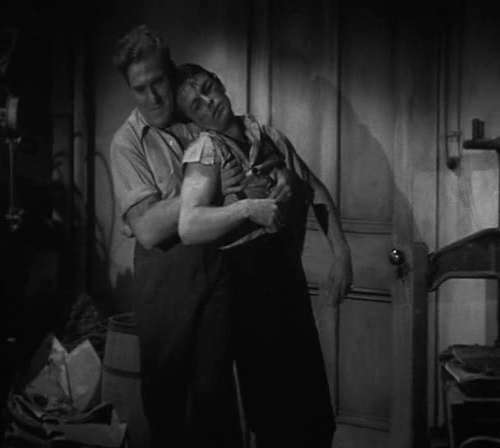 The other is when Reno cuts down the four remaining men of Pete the Finn’s gang, including Pete, after implicitly promising them safe passage in return for coming out of the building where they’re holed up. (Chapter XXV, Whiskeytown.) (See NoelCT’s earlier post for a quote.) This is reminiscent of the scene near the end of the movie when Seibei, Orin, and their son surrender only to be cut down by Ushitora’s gang. My conclusion? While the book may have suggested a couple of specific scenes in the movie, overall, it was no more than inspiration.